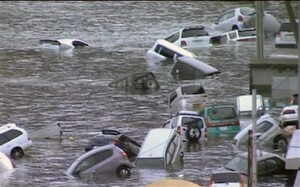 Japan was hit with a major tsunami on Friday, bringing 13-foot waves following an 8.9 magnitude earthquake off the coast. A earthquake hit northern coast of Honshu, Japan on March 9, 2011. The Japan earthquake registered 7.2 on the Richter Scale; a 6.3 magnitude aftershock was felt shortly after. A tsunami warning has been issued for Japan's northeastern coast. There have been no early reports of damage or injuries due to the Japan earthquake. A local meteorological agency warned that a tsunami of about 20 inches would hit the areas of Iwate, Miyaga, Fukushima around noon Wednesday. 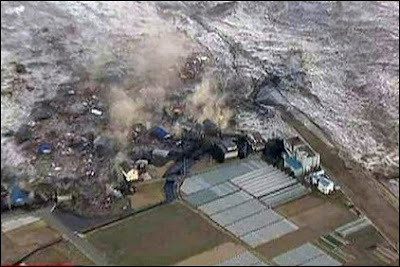 Japanese officials are reporting at least 300 people are dead and many others are missing, but those numbers are expected to increase as they assess the damage. 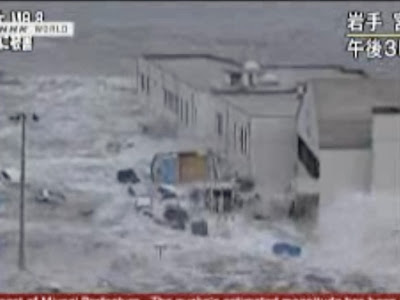 The tsunami washed away buildings, homes and cars and caused extensive damage. The earthquake hit at 2:46 p.m. bringing with it strong aftershocks. The earthquake is the largest in Japan’s history. Prime Minister Naoto Kan was on TV, telling residents to remain calm in the midst of the devastation. “The earthquake has caused major damage in broad areas in northern Japan,” Kan said, and urged people to move to higher ground. Experts are warning more giant waves could hit land, not only in Japan, but in Hawaii, South America, Alaska, the U.S. West Coast and British Columbia. The governor of Hawaii ordered the evacuation of coastal areas and warned residents to take the threat seriously. Waves are predicted to hit the western coast of the United States between 11 a.m. and 11:30 a.m. EST Friday. People near the beach and in low-lying coastal areas of Point Conception in Santa Barbara County were told to move immediately inland to higher ground. While the tsunami is likely to go around smaller islands, the size of Hawaii’s islands will amplify the waves, which will crash hardest against harbors and inlets. Closer to the focus Communities that are closer to the focus of an earthquake usually experience stronger shaking. Nearer to the surface Earthquakes that occur near the surface cause more damage than those deep underground. As the shaking goes on The longer the shaking continues, the more damage it causes. The 2001 Nisqually earthquake lasted about 40 seconds. The 1700 subduction zone earthquake may have lasted five minutes. On loose ground Loose materials—landfills and loose sediments—shake more than solid bedrock. Geologists compare this to a bowl of jelly. If it’s jostled, the bowl itself will shake just a little. But the jelly keeps on jiggling; it actually amplifies the motion. On wet soil If loose soil is saturated with water, it may flow like a liquid when shaken in an earthquake. This process is called liquefaction. The soil loses its strength and no longer supports structures built upon it. On slopes During quakes, slopes may slide. Also, if trees have been cut down, slopes are more vulnerable to earthquake damage. Slopes composed of loose backfilled materials may be unstable during quakes. Near structures If you’re in the middle of a wheat field, you’re not likely to be hurt by an earthquake. Most damage—and most injuries—involve human structures. Unreinforced brick walls and chimneys can’t handle the side-to-side shaking of a large earthquake. Falling bricks are a major cause of injuries. Older concrete structures also may be unstable. And even a small earthquake may bring household objects down around your ears. Damage to lifelines—roads or bridges—can have life-changing impacts on area residents. Whole communities may be cut off from fire engines, ambulances, and supplies. Although we can’t prevent earthquakes, engineering researchers are pioneering safer construction techniques to protect us from earthquake damage. Homes now are bolted to their foundations, brick and concrete are specially reinforced, and roads, bridges, and buildings are built with earthquakes in mind.